A downloadable PDF quilt pattern that measures 60″ x 80″ (suitable for a twin bed or to use as a lap quilt). 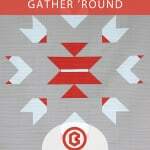 Gather ‘Round is a bold and graphic modern quilt pattern suitable for the advanced beginner (A new quilter with one or two quilts under their belt). Each step of the sewing process is explained with easy-to-follow diagrams. The pattern also includes cutting guides to prevent waste and pressing instructions to ensure seams nest easily.